Life cycle: One to three generations per year. The adults hibernate in the soil in the winter. Physical Description: The Adult is yellowish brown, with variable number of black spots on its head and five black strips on each side of its hard shell The Eggs are yellow or orange and laid on end, grouped in rows, on the underside of leaves. The Length is .2 - .4 inches long. The Larva is cherry red, with a black head and legs in the early stage, changing to yellowish red or orange, with rows of black spots on each side of its body. The larva length is about .6 inches full grown. Feeding characteristics: Both the adult and larva attack the leaves of potatoes, tomatoes, eggplant, peppers, and ground cherries. Controls: Mulching well with a 6 - 12 inches of mulching material, which keeps the adult beetles from climbing to the stems. Apply rotenone if serious. A fungus, Beauveria bassianna can be used to control this pest and a few others. A Bacillus thuringiensis known as M-one (Bt/san diego) has proven very effective. Parasitic Nematodes kill the larvae when they move to the ground to transform into adult beetles. Lady Beetles and the Spined Soldier Bug are effective against the larva. 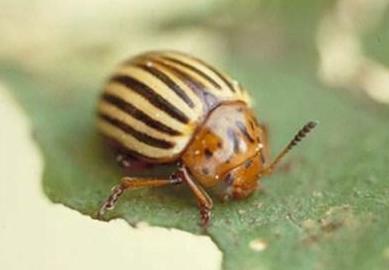 Plants that repel the Potato Beetle are Green Beans, Horseradish, Dead Nettle, Flax, Catnip, Coriander, Nasturtium, and Tansy (Tanacetum vulgare).